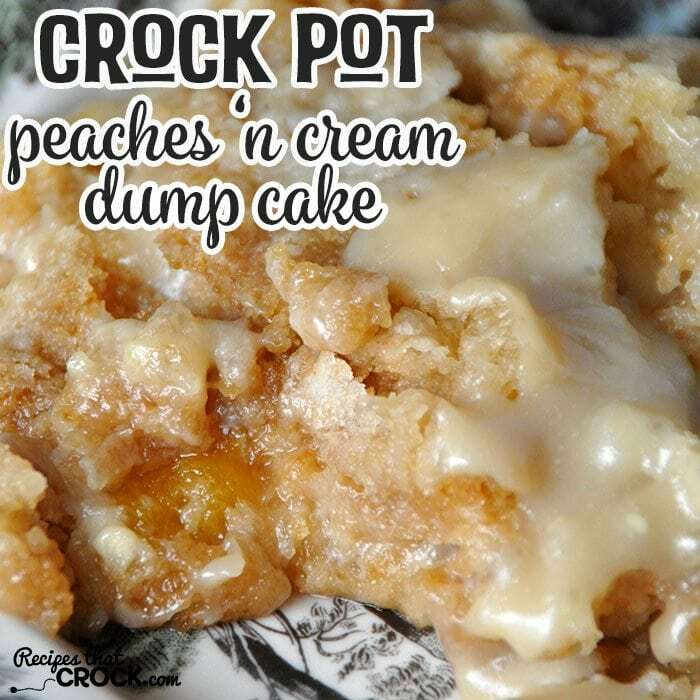 Crock Pot Peaches 'n Cream Dump Cake - Recipes That Crock! One of my favorite things that Mom and Dad make when we visit them when they are camping with horses is their dump cake in a dutch oven. 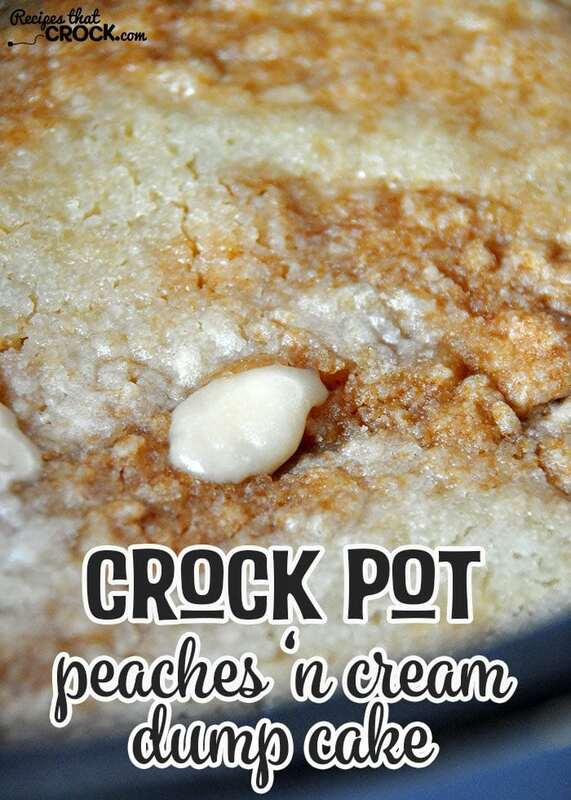 Dad loves peaches and cream cheese, so this recipe is something they make up all the time. I thought it would be perfect to whip up in my crock pot! While I haven’t tried this out with the cream cheese with other pie fillings, if you are not a fan of peaches, but like other pie fillings with cream cheese, give it a try and let me know what you think! I used my 6-quart insulated slow cooker (aka Sir Hamilton) for this recipe. You know he’s my favorite! 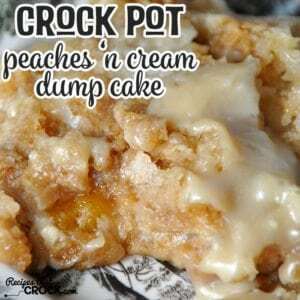 This Crock Pot Peaches 'n Cream Dump Cake was an instant family favorite! Diabetic AND on a diet. Going to sub out ingredients to follow diet. Will let you know how it turns out. Hi, I have several size’s of crockpots and love them all AND love yalls recipes!! I have a new 9×13 casserole crockpot that I can’t wait to try this in! I need more recipes for it though. how would I convert an oven casserole to my casserole crockpot? The link below is for our casserole crock pot recipes. Converting recipes from oven recipes can be a lot of trial and error, so I can’t really give you a rule to follow on converting them. Usually I find something similar and use that recipes cooking times as a general guideline and watch it VERY closely the first time I make it. Hope that helps! Enjoy! Instead of paper towels, you can use a terry dish towel. Works great with any crock pot recipe where you don’t need the extra moisture! Can I make this in the oven instead? If so how long would you cook it for? I haven’t ever made this (or any other dump cake) in the oven. We have always made them in our slow cookers or mom and dad’s Dutch oven. I would assume that it can be made in the oven, but I would hate to give you a oven temp and time without trying it first. If you give it a try, let me know how it works! Enjoy! I wouldn’t recommend using canned peaches in this recipe. The peach pie filling has a thickness to it that really works well in this recipe. Enjoy! Can I use my casserole crockpot? If so, would I cook it just as long? I haven’t tried it in my casserole crock yet, but I think it would work well! I think it would be around the same cooking time. As always, watch it closely the first time you make it to know exactly how your crock pot cooks it. Enjoy! Could you substitute gluten free cake mix? I have not ever used a gluten free cake mix, but if you do, let us know how it turns out! Enjoy! This does sound quick, easy, and delicious. I’m curious for the reason for the paper towels. Would wax paper or tin foil also work? It really is! The paper towels collect the moisture that usually gathers on the lid and keeps it from falling back down into the cake, so I don’t believe wax paper or tin foil would work. Enjoy! Can you use fresh peaches? How many would you use? You can use the homemade pie filling from this recipe Cris made. A full batch of this pie filling would make around 4 cups, so if you want a lot of peaches, make up a full batch. If you want less, then you can make a half batch. Enjoy! Whats the paper towels do? Cut the steam? The paper towels collect the moisture that usually gathers on the lid and keeps it from falling back down into the cake. Enjoy! How did your folks make this in their Dutch oven? Cris actually did a post on Goodeness Gracious (our sister site) about doing a similar recipe at camp in the Dutch oven. I’ll post the link below. Enjoy! Sounds marvy! Gotta try it! You are gonna love it! Enjoy!